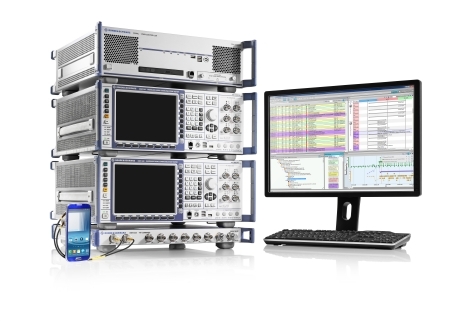 Rohde & Schwarz has launched the R&S ZNLE vector network analyzer to address the requirements of customers looking to perform RF measurements to characterize components such as antennas, attenuators, filters and PCBs. The new standalone instrument weighs 6 kilograms and has a footprint of just 408 millimeters x 235 millimeters, saving up to two thirds of space on the workbench compared with competitive VNAs, according to the company. The two-port vector network analyzer is designed to save space and provide quick and accurate measurements, not least due to its easy-to-use S-parameter wizard. The R&S ZNLE performs bidirectional measurements of the S11, S21, S12 and S22 S parameters. An optional GPIB interface is available for remote control of the analyzer. The instrument comes in two models with frequency ranges from 1 megahertz to 3 gigahertz (R&S ZNLE3) and to 6 gigahertz (R&S ZNLE6). The VNA offers optimal RF performance with a wide dynamic range of typically 120 decibels and measurement bandwidths from 1 hertz to 500 kilohertz. Measurement time is just 9.6 milliseconds for 201 points at 100 kilohertz measurement bandwidth, for a 200 megahertz span, with two-port TOSM/SOLT calibration. For stable, repeatable measurements, the R&S ZNLE produces low trace noise of typically 0.001 decibel. The R&S ZNLE features a large 10.1" WXGA touchscreen, providing good visibility of all traces. The touchscreen supports zooming in and out of traces using multitouch gestures. The user interface is designed to make it possible to access every function with a minimum number of steps. Undo/Redo softkeys are available to cancel and restore user entries. Context-sensitive help menus for the diverse functions and parameters facilitate interactive operation. The instrument incorporates the calibration wizard used in other Rohde & Schwarz R&S ZNx analyzers. Calibration units are also supported. To make life even easier, the "Start Auto Cal" function delivers automatic calibration at the touch of a button.